Browns will be held out for filler/spot guy! Configuration: 10 boxes per case. 1 pack per box. 1 card per pack. 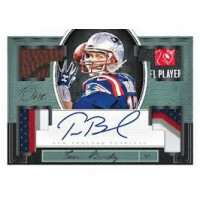 - New for 2018, Panini One football delivers one on-card autograph per box! - All autographs in Panini One will be on-card from the top 2018 NFL rookies, current stars and retired legends! - All patch cards feature prime or super prime, and all cards will be produced on premium acetate or canvas stock! - 85% of cards will be on-card patch autos! These Rookie Patch Autographs feature custom embossed card stock, on-card autographs and oversized patches! Rookie Dual Patch Autographs includes two patches that perfectly frame the players autograph. Produced on acetate stock these Premium Rookie Patch Autographs are sure to stand out! Find rare autos from top rookies in this non-patch auto set. With a checklist full of Hall of Famers these Quad Patch Autographs are amazing! Look for names like: Russell Wilson, Aaron Rodgers, Peyton Manning, Patrick Mahomes II and more! Patch Autographs Variation features a classic dark design on acetate. This shadowbox autographed set includes top names like: Tom Brady, Aaron Rodgers, Randy moss, Emmitt Smith and many more!